For the first time since 2006, the GPRC Wolves Women’s X-C Running team has hit the podium at the ACAC Championships. Under cool, snowy conditions, the #7 nationally ranked GPRC ladies placed second, recording a team score of 47 points, 27 points back of the winning MacEwan University. SAITwas third, 25 points behind the Wolves. 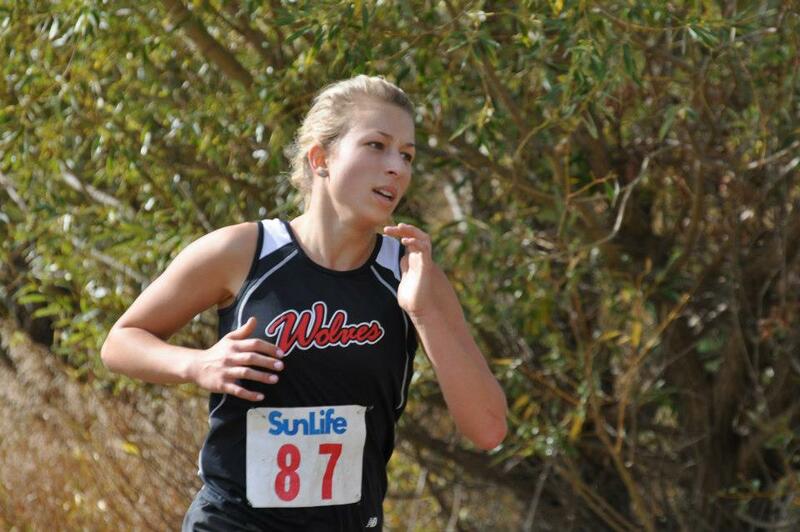 The Wolves were led by rookie Jamie Wigmore who produced a season’s best 4th place finish. Amanda Patteson (12th), Wolves Soccer standout Katie Spaidal (13th), and Kayla Hardy (18th) were the next GPRC runners. Chassity Mohan (30th), Stephanie Marcotte (31st), Calla Scott (47th), Emily Whalen (65th), and Kirsten Manz (71st) also represented the Wolves at the Championships. The battle for the womens individual title was dramatic. Pre-race favourite Alexandra Gordichuk, undefeated in four ACAC Grand Prix races this season, started strong but faded badly over the final 2 kms, eventually finishing 8th. Concordia’s Marriya Jenkins broke away and won by 61 seconds, recording a time of 19:14 for the 5 km distance. A pair of MacEwan runners, Vanessa Trofimenkoff and Isabella Englert claimed the minor medals. In the mens 8 km race, the Wolves improved their pre-championships ranking by one sp0t, placing 5th. As he’s done all season, Hayden Hollowell led the way with an 11th place finish. Wolves Basketball team member Riley Wallace had a strong run, placing 16th, four spots better than Joren Manz. Vaughan Marillier (33rd), Cody Krantz (51st), and Ryan Peters-Friesen (55th) rounded out the Wolves finishers. SAIT upset Lethbridge College by a mere 3 points for the men’s team crown. MacEwan University secured the bronze. Upsets were also the theme of the day in men’s race as former Wolves standout Devin Woodland, now running for Red Deer College, ran away from the field in the last 2 km to post the win. Woodland had to hold off teammate Kieran MacDonald in the finishing sprint to secure the victory. Kenton Sportak from SAIT placed third, while pre-race favourtie Solomon Ngetich from Lethbridge, who previously had been undefeated in ACAC Grand Prix races this season, struggled home in 6th place. Two Wolves runners were recognized Saturday for Conference honours. Wigmore was named to the ACAC All Conference team, while Hollowell was honoured for his 8th place finish in the 2012 ACAC Grand Prix Series. Next up for the Wolves is a trip to Montreal for CCAA X-C Running Nationals on November 10. This entry was posted in Cross Country, Uncategorized and tagged ACAC, Cross Country Running, GPRC, Grande Prairie, Grant MacEwan University, Lethbridge College, MacEwan University, Red Deer College, Wolves, Wolves Cross Country Running. Bookmark the permalink.